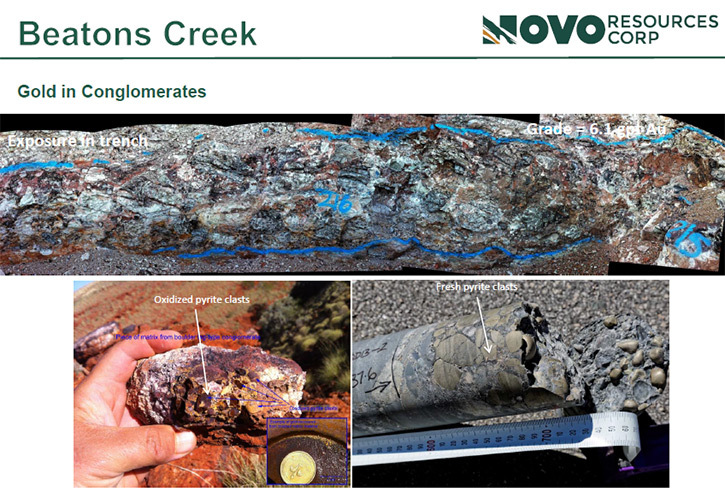 Novo Resources Corp. (TSX-V: NVO; OTCQX: NSRPF) is focused on acquiring and exploring gold properties in Western Australia. 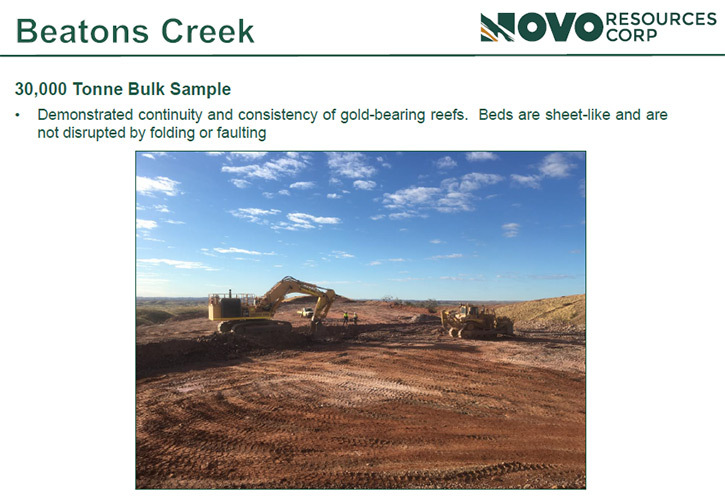 We learned from Dr. Quinton Hennigh, President and CEO of Novo, they have been exploring for gold in the Pilbara region of North West Australia, and have discovered significant deposits. Currently, they are advancing one of them, the wholly owned Beatons Creek Paleoplacer Gold Project, towards production. Near term plans include; expanding the resource, completing the pre-feasibility study, with the goal of getting into production sometime in 2018, mining around 2,000-2,500 tons per day and generating about 50,000 gold ounces per year. 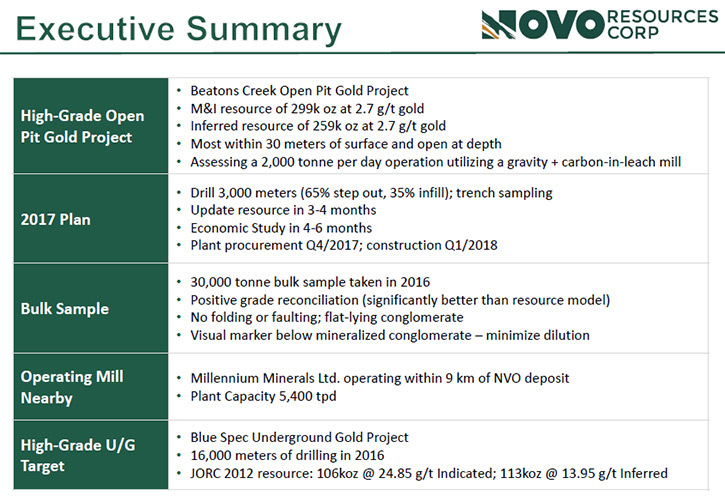 Dr. Allen Alper:	This is Dr. Allen Alper, Editor-in-Chief of Metals News, interviewing Dr. Quinton Hennigh, President and CEO of Novo Resources Corp. Quinton, could you give our readers/investors an overview of Novo Resources? Dr. Quinton Hennigh:	Certainly. 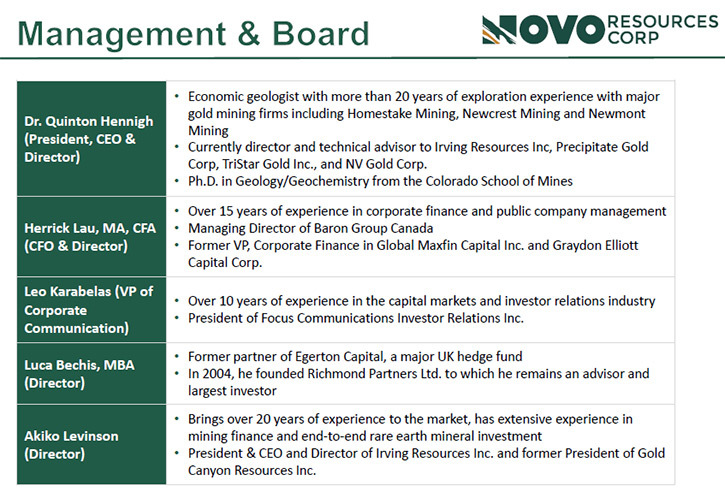 Novo Resources is a Canadian-listed junior company. It trades on the Toronto Ventures Exchange. Its symbol is NVO. 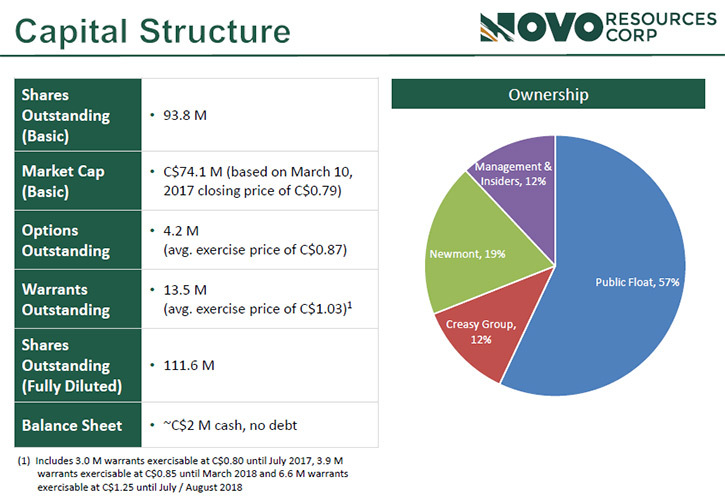 Novo Resources is listed in Canada, but our assets are mainly in Australia. 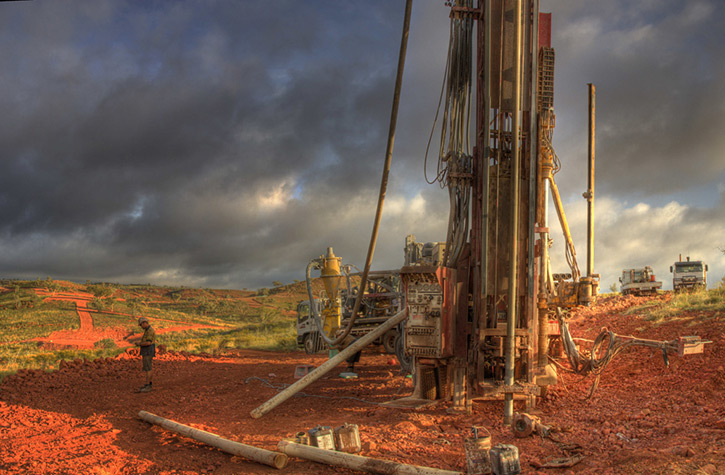 We're looking for gold in a region in northwest Australia called the Pilbara. Our company's about seven years old. We've been looking for a certain type of deposit here in Australia, a quite unusual gold system hosted by conglomerates similar to deposits in South Africa. At Beatons Creek, we have discovered significant deposits of this type, and our team in Australia is advancing it towards production at this time. Dr. Allen Alper:	Sounds great! Could you tell us more about the Beatons Creek deposit in Australia, what differentiates it from others and a bit about the geology of the area? Dr. Quinton Hennigh:	The region we're exploring is called Pilbara which is a very old piece of crust. Basement rocks are about 3.0 to 3.6 billion years old. On top of that, somewhat younger sedimentary rocks were deposited about 2.7 billion years ago. The sedimentary rocks contain horizons of conglomerates that bear gold. Sedimentary rocks were laid down by rivers along an ancient seaway. As sea level periodically rose and fell, it cut across these conglomerate deposits and helped concentrate the gold within them. They are termed “lag” deposits, sheet-like, with elevated gold and are comprised of boulders of quartz that have been cemented by a sandy matrix bearing gold grains. Dr. Allen Alper:	Could you tell our readers/investors a bit more about the resource you found and your trenching activities? Dr. Quinton Hennigh:	We've trenched the deposit as well as drilled it with reverse circulation drilling. The current resource stands at about 300,000 ounces measured and indicated, and 260,000 ounces of inferred resources. The grade is quite good, about 2.7 grams per ton. Our trenching and the drilling, used to define the resource, was very aggressive. The gold is quite coarse in nature, and because it's nuggety, we take large samples to get better representation. We collect 50 kilogram samples, which are over about a hundred pounds, and used those for our assays, or analyses of gold content, to define the resource. Currently, we are expanding the resource through additional trenching and drilling. We're also attempting to upgrade resources from inferred up to indicated and measured. Wherever we have inferred resources, we are in-filling with sampling to attempt to upgrade those to indicated, in anticipation of using a bigger measured and indicated resource base to undertake a pre-feasibility study later this year. Dr. Allen Alper:	Excellent, excellent! I understand you have plans to bring this project into production by 2018, is that correct? Dr. Quinton Hennigh:	That's our goal. Yes we're looking to advance this resource through pre-feasibility study and then to production sometime in 2018. We're on a fast-track both in terms of economic study, as well as permitting work that's required. The concept is to put together a scenario where we mine, say around 2,000 to 2,500 tonnes per day, which is a fairly modest scale compared to many mines. We are contemplating using gravity and CIL processing. CIL, of course, Cyanide-In-Leach. We anticipate very good recoveries given our test work indicates around 98 percent recovery using gravity and CIL. Our target is a mine that could potentially generate somewhere on the order of perhaps 50,000 ounces per year, over a sustained mine life. Right now we're looking at oxide material, but may consider looking at fresh material, too. Our target is to demonstrate Beatons Creek can become a potentially high-margin gold mine. Dr. Allen Alper:	That sounds excellent. Could you tell our readers/investors about yourself, your team and your board? Dr. Quinton Hennigh:	I'm an economic geologist with about 28 years’ experience in the mining industry. I started working for major mining companies early in my career including Homestake Mining, Newcrest Mining, and Newmont Mining. In 2007, I entered the junior mining stage where I worked with a company called Gold Canyon Resources. We discovered a five million ounce deposit in Ontario, Springpole, which was recently sold to First Mining Finance. 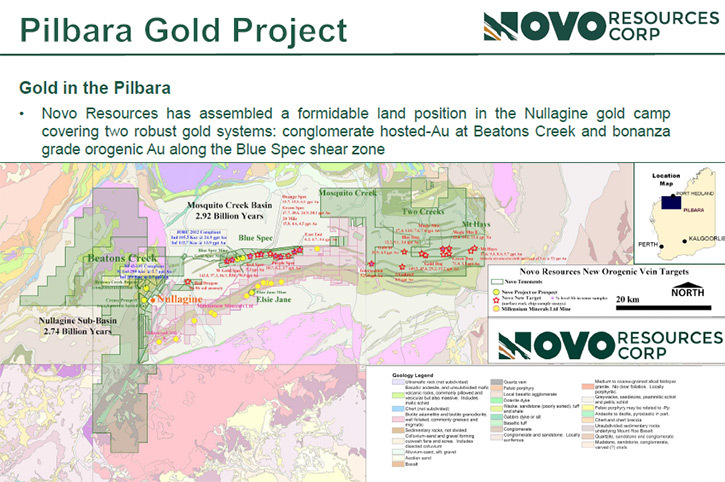 I started Novo around 2010 to focus on work in the Pilbara. Our team has built the company from the ground up. We took what was a fairly conceptual idea and discovered a significant deposit that we are now advancing toward production. Dr. Allen Alper:	Sounds great! Excellent background! Dr. Quinton Hennigh:	Also, on our board, we have a gentleman, Herrick Lau, our CFO. Herrick has worked with me for about 10 years, basically since I left Newmont. Very solid! Akiko Levinson, was President and CEO of Gold Canyon Resources, for whom I helped drill up the Springpole deposit I mentioned earlier. We also have Luca Bechis, a director and good friend. He has a strong financial background and helped put in the initial capital to get Novo started. Dr. Allen Alper:	That sounds excellent. Could you tell me a little bit about your share and capital structure? Dr. Quinton Hennigh:	We have about 94 million shares out at present. We are undertaking a raise at present so that number will increase. Currently, fully diluted, we are at about 111 million shares. As recently announced, we anticipate raising around 12 million dollars Canadian. Our current shareholder base includes Newmont Mining, which holds just under 20 percent. Also included is Mark Creasy, a well-known prospector in Australia, who helped Novo put together our land package. Also included is Luca Bechis, a founding shareholder and director of Novo, and a few other select individuals. Dr. Allen Alper:	Sounds great! It sounds like you have great backing and good finances. That's excellent. What are the primary reasons our high-net-worth readers/investors should consider investing in your company? Dr. Quinton Hennigh:	There are two really important things that stand out. Firstly, Australia is a great gold mining jurisdiction, certainly one of the top mining jurisdictions in the world. Many gold mines operate across Western Australia, it is straightforward to permit them, and relatively easy to advance things in general. Current values of mining projects here in Australia are quite high because cost-wise, it is an excellent place to operate. The Australian dollar has gone down recently so the Australian gold price is quite high. Secondly the fundamental geology of the sort of deposit we have at Beatons Creek also underpins our value. Although our resources are modest at present, these systems are open to significant expansion, much like the deposits of South Africa, which are sheet-like and continue downward into the basin. Dr. Allen Alper:	That sounds excellent. Is there anything else you'd like to add, Quinton? Dr. Quinton Hennigh:	Look for us to advance things very quickly over the next couple of years. We're going to move towards development as quickly as possible, but we also have some fairly exciting exploration activities, both at Beatons Creek and farther afield. There’s reasonable potential for more of these styles of deposits, and we're looking at pursuing opportunities in this region very aggressively. Dr. Allen Alper:	Sounds terrific!